2015 AIRAID COLD AIR KIT MUSTANG 5.0 BLACK FILTER FEE UPS! 2015 AIRAID COLD AIR KIT MUSTANG 5.0! 2015 Mustang GT 5.0L 304 stainless steel 3" catback dual-exhaust W/ XPIPE & retro chambered mufflers and mirror-polished stainless steel slash-cut conical double-wall tips. Includes hangers and clamps; superior performance with a lifetime guarantee. CANTON RACING BILLET ALUMINUM WATER NECK FOR 302 5.0 HO ENGINES WITH 90 DEGREE NECK. STAINLESS CAP SCREWS. ROTATES 360 DEGREES FOR MAX ADJUSTABILITY. FOR 1.5'' HOSE. CANTON RACING BILLET ALUMINUM WATER NECK FOR351C-429-460 ENGINES. STAINLESS CAP SCREWS. ROTATES 360 DEGREES FOR MAX ADJUSTABILITY. FOR 1.5'' HOSE. BILLET ALUMINUM WATER NECK FOR 351C-429-460 ENGINES. 16AN FITTING .STAINLESS CAP SCREWS. INNOVATORS WEST NEW 460 CAMSHAFT BELT DRIVE.Made entirely in house, the belt drives feature a billet machined aluminum cover, anodized precision machined pulleys and a top quality Goodyear belt. FORD RACING 2015 8.8 TRACTION LOK DIFFERENTIAL. 34 SPLINE. BILLET TIMING POINTER FOR 429-460 BIG BLOCK FORDS BLACK ANODIZED. Performance Automatic Engine To Bellhousing Separator Plate FOR FE 390-427-428 FORDS. Performance Automatic Engine To Bellhousing Separator Plate for 4.6 ,5.0 COYOTE engines. Performance Automatic Engine To Bellhousing Separator Plate FOR 429-460 FORDS. LIGHTWEIGHT BOLT IN STEERING COLUMN FOR GM 82-92 CAMAROS. INCLUDES QUIK RELEASE HUB AND 3-5 BOLT BILLET STEERING WHEEL ADAPTER. OFF ROAD USE ONLY! PIC IS OF A SIMILAR PRODUCT. LIGHTWEIGHT BOLT IN STEERING COLUMN FOR GM 1970-1981 CAMARO/FIREBIRD. INCLUDES QUIK RELEASE HUB AND 3-5 BOLT BILLET STEERING WHEEL ADAPTER. OFF ROAD USE ONLY! Pic is of a similar part. CANTON UPGRADED ALUMINUM FUEL FILTER FOR 84-97 FORD EFI CARS. DOUBLE THE FILTRATION OF OEM FILTERS.1 MICRON FILTER PREINSTALLED. CANTON RACING BILLET ALUMINUM WATER NECK FOR FE ENGINES. STAINLESS CAP SCREWS. ROTATES 360 DEGREES FOR MAX ADJUSTABILITY. FOR 1.5'' HOSE. FLOWMASTER AMERICAN THUNDER(2 CHAMBER STYLE) AXLE BACK EXHAUST SYSTEM FOR 2015 MUSTANG GT. ALUMINIZED BLACK FINISH. 3.0 '' DIAMETER WITH 4.0'' POLISHED TIPS.GET THAT FLOWMASTER SOUND ON YOUR NEW STEED! PLUS GET FREE 48 STATE SHIPPING! FORD RACING RING AND PINION 3.55 RATIO FITS 2015/ MUSTANG 8.8 WITH IRS AXLE. FORD RACING RING AND PINION 3.73 RATIO FITS 2015/ MUSTANG 8.8 WITH IRS AXLE. DAACO OUTLAW SERIES 10 '' TORQUE CONVERTER FOR T350 AND GM POWERGLIDES WITH T350 SPLINE .2500-2900 STALL .ANTI BALLOON PLATE AND BRACED FOR TRANS BRAKE. DAACO OUTLAW SERIES 10 '' TORQUE CONVERTER FOR T350 AND GM POWERGLIDES WITH T350 SPLINE .2900-3300 STALL .ANTI BALLOON PLATE AND BRACED FOR TRANS BRAKE. DAACO OUTLAW SERIES 10 '' TORQUE CONVERTER FOR T350 AND GM POWERGLIDES WITH T350 SPLINE . 3300-3700 STALL .ANTI BALLOON PLATE AND BRACED FOR TRANS BRAKE. DAACO OUTLAW SERIES 10 '' TORQUE CONVERTER FOR T350 AND GM POWERGLIDES WITH T350 SPLINE . 3700-4100 STALL .ANTI BALLOON PLATE AND BRACED FOR TRANS BRAKE. DAACO OUTLAW SERIES 10 '' TORQUE CONVERTER FOR T350 AND GM POWERGLIDES WITH T350 SPLINE .4100-4500 STALL. ANTI BALLOON PLATE AND BRACED FOR TRANS BRAKE. JE MULTI LAYER HEAD GASKET FOR BLOWN/ NITROUS APPLICATIONS. A MUST ON DARTON SLEEVED BLOCKS. Lokar UNIVERSAL throttle cables have a Teflon inner liner and a BLACK BRAIDED stainless steel outer covering, along with aluminum Clevis ends for smooth, no-bind cable operation.. Will work on most V8 carb applications. NITROUS EXPRESS 10 LB NITROUS BOTTLE WITH THE FAMED LIGHTNING VALVE. POWDERCOATED WHITE. AUTOLITE XP XTREME SPARK PLUGS FOR 2011-14 5.0 32V ENGINES.IRIDIUM ENHANCED ELECTRODE.DELIVERS PREMIUM PERFORMANCE AND DURABLIITY FOR HIGH PERFORMANCE APPLICATIONS. SPICER STEEL CORE 8.8 REAR COVER GASKET OFFERS MAXIMUM DURABILITY. ANTI STICK COATING MAKES THIS GASKET REUSABLE. 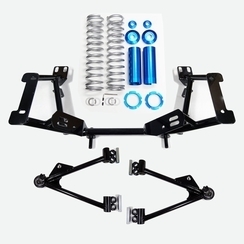 AJE SUSPENSION DRAG RACE REAR SUSPENSION KIT FOR 79-04 MUSTANGS CONSIST OF ANTI ROLL BAR, ADJUSTABLE LOWERS, AND UPPERS, PLUS SPHERICAL UPPER BUSHINGS. DYNATECH T304 STAINLESS STEEL LONG TUBE HEADERS 1 7/8' DIA. 3.0" COLLECTOR. FITS 2011/5.0 COYOTE ENGINES IN MUSTANG GT. Dynatech auger-style muffler inserts are designed to slide into your 3 '' ID round tube piping. They weigh only 1 lb. and offer a 6-7 dB reduction over standard straight-through pipe. Dynatech auger-style muffler inserts are designed to slide into your 3.5 '' ID round tube piping. They weigh only 1 lb. and offer a 6-7 dB reduction over standard straight-through pipe. LIGHTWEIGHT BOLT IN STEERING COLUMN FOR GM 1993-2002 GEN 4 F-BODY CARS. INCLUDES QUIK RELEASE HUB AND 3-5 BOLT BILLET STEERING WHEEL ADAPTER. Billet aluminum nitrous brackets securely mount and hold single stage nitrous and fuel solenoids. Brackets fasten to the carb mounting studs. CLEAR ANODIZED FOR 4150 CARBS. Billet aluminum nitrous brackets securely mount and hold single stage nitrous and fuel solenoids. Brackets fasten to the carb mounting studs. CLEAR ANODIZED FOR 4500 CARBS.